Having run through the basic panoply of Tigers in 1/72 scale – Porsche, Initial, Mid, and Late production, with and without zimmerit, and Gruppe Fehrman – DML has now started over with remolded kits. This new version has more details, such as partial turret interior with commander and gunner seats and a breech for the big 88mm gun, as well as radiator bays inside the engine compartment. They have also borrowed the interconnected wheel sets from their popular Sd.Kfz. 251 series of halftracks and the new model has the back roads of road wheel connected by arcs that do not show once the entire four-layer set of road wheels is assembled (inner, center inside, center outside, and outer). Thus the entire 32 wheel set of road wheels per side now only requires seven parts – three linked sets and four single road wheels. The wheels are detailed on both sides even though the insides will be impossible to see. The turret is properly asymmetric and consists of a one-piece shell with separate roof and front. As it is the early model it comes with two stowage bins, two pistol ports, and a “dustbin” cupola with an interior set of periscopes. It also has a fording air cleaner and etched brass parts for the intake grilles and radiator guides. The model also offers a choice between tall and short exhaust tubes for the rear of the hull. The tracks are now DS plastic which will be welcome over the original black vinyl tracks. The model comes with but one finishing option - bort number white 100 and panzer grey overall paint. A tiny sheet of Cartograf decals is provided. 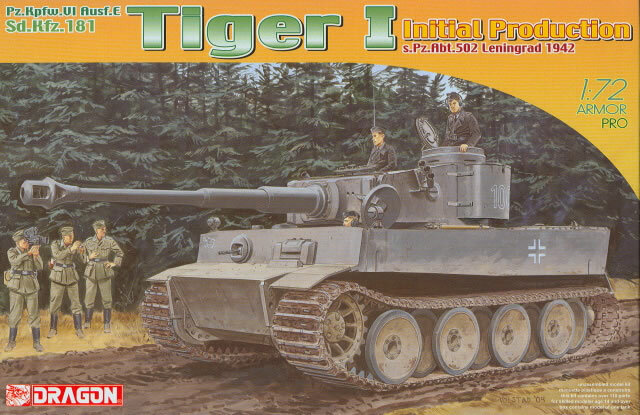 Overall this is a nice upgrade but as it now costs one-third more than the earlier versions I am not sure how many modelers really want a more detailed small scale Tiger. Thanks to Freddie Leung of DML for the review sample.